In the trend of coloring as a form of relaxation, one of the most popular types of patterns to color is the mandala. Mandalas are usually circular geometric patterns. Some people find the drawing and coloring of a mandala as a form of meditation. As they focus on coloring in the patterns of the form, they relax, their mind grows quiet, and they may enter into a spiritual space. What exactly is a Mandala? A mandala is a spiritual symbol in Buddhism and Hinduism. It’s a symbolic representation of the universe with an inner and outer world. The word mandala comes from Sanskrit, an ancient Indian language. Literally mandala means “circle.” The circle is seen as a magical form, without beginning and end, just as the universe is believed to have no end. The Sanskrit word mandala indicates everything that is round or circular. In tantric traditions, it often refers to a sacred space, which can be round or square or any other form. Deities are invited to enter this space by uttering powerful words (mantras). The prototype of the mandala is a square with four gates containing a circle with a central point. Often the mandala is also in an outer circle. This basic form can be found in many ancient mandalas, but there are many more variants. The mandala can also be filled with all kinds of patterns: geometric figures, Buddhist saints, flowers, you name it. The mandala is used as an object to focus your attention on while meditating. Because of the symmetrical shape, your attention is directed to the center. People in the Western world often used a freer form of the mandala, which is more reflective of the inner self and the unconscious self. Regardless of what mandala you use, coloring it can be very meditative and relaxing. Children: Because the mandala isn’t a literal representation of reality, children can fully enjoy their creativity. They don’t have to worry about choosing the right color green for the trees or what color blue the sky should be. The mandala can have all the colors of the rainbow. Or just their favorite color. Coloring a mandala is an excellent way to end a busy class and help children unwind. Adults: Everyone has had those days when your head overflows and your thoughts just seem to keep running in circles. Coloring a mandala for an hour may help you calm down. By focusing only on the pattern and colors, your mind may become wonderfully empty. You come to rest for a little while. 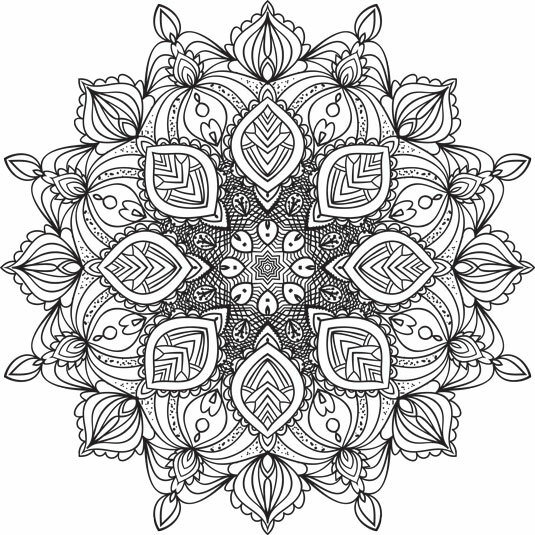 Elderly: For the elderly, coloring mandalas may help you keep your memory in shape. The repetitive nature of many mandalas allows you to create beautiful symmetrical patterns, but you must concentrate to ensure that your colors are symmetrical (if that is, indeed, your goal). Remaining focused on a creative endeavor of this sort may keep your mind sharp. Finally, you may not think at first glance that coloring mandalas is something that can be done in a group, but it’s a great activity to do with friends or relatives. Make a photocopy of a mandala that everyone can work on at once and go to town. Or give everyone their own copy of the same mandala and see how people come up with different colors and patterns for the same design. You can also just pass out different mandalas and enjoy being creative together.